How does the delivery process of an orthosis look like? If you will get an orthosis, a lot will happen. On this page you can read what’s going to happen before your orthosis is just as normal as your own shoes. The provision of an orthosis always happens according to a standard schedule. We will walk you through the different phases. If together with you is decided that an orthosis may be a suitable feature for you, the measurement should be taken. Click here for more information about the measurement process. This measurement happens by taking photos. Casting the arm or leg is not needed at Ambroise. When we have the measurement data, Ambroise can start preparing the production of your orthosis. The first step is to load the measurment photos of you into our own developed software. That software is able to convert the measurement data into a detailed production order (including molds, drawings, charts and component lists). Now the actual production can start. Based on that order, an individual customized orthosis will be compiled for you. During this production we use strikt quality procedures. We only use the best materials and components. Many of these parts are made especially for Ambroise on our specifications. For example, we can make demands on materials and tolerances in size. And that is what we are doing in the Netherlands in the vast majority. That gives us the best guarantee that we get top quality parts for your orthosis. 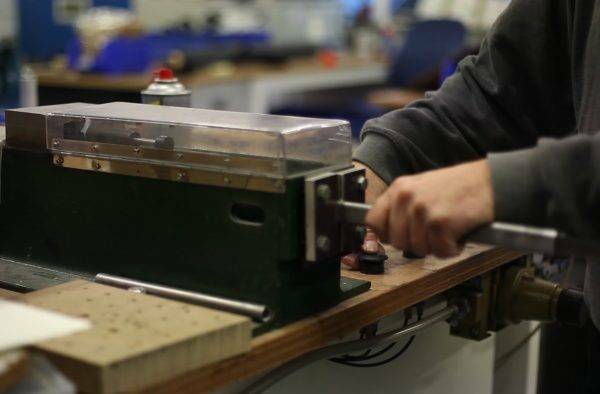 For the production of a customized orthosis at Ambroise we use many specially developed machines and arrangements. This way we can make exactly what we want and meet the high standards that are asked by a customized orthosis. Once your orthosis is completed, it will be carefully checked once more using a comprehensive checklist. Then the orthosis is released by us. Then you will receive a call to come and fit the orthosis. During this fitting phase, the latest adjustments are made and the orthosis is adjusted to your arm or leg. Even though we are able to make an appropriate orthosis with our software, only when you are going to load and use the orthosis we notice where small adjustments are needed. Sometimes a little bit extra or less pressure a great influence for the user. That is why the fitting phase is an important teamwork, with you as the team’s most important player. From our knowledge and experience, we look at how we can find the optimal adjustment for you, depending on your feedback. Additionally, you should note that the actual irritations of wearing an orthosis only occur after some time. That’s why it’s a fitting phase and maybe more appointments are needed to help solve all those points. You must be able to trust the orthosis and have the least possible obstacle. Only then can you get the maximum from the orthosis and we have provided an orthosis that really fits your body. After your orthosis is properly adjusted, the “real” work will start for you. Now you must learn how to handle your new orthosis. We advise to receive professional support from a physiotherapist with experience in the field of orthopedics. For the leg orthosis, good knowledge of gait training is a must. If you have been wearing your orthosis for about two to four weeks, we advise you to make a check-up appointment. As you slowly get used to your orthosis, it may be necessary to adjust it. As mentioned above, some things will only be noted during proper use of the orthesis and not during a first fitting appointment. Because, depending on your insurer, you have to use your Ambroise orthosis for at least two to three years, we make sure that the orthosis really fits your body, even at the end of the day, wearing it a full day. And we do that check as often as necessary. Usually after a first check (see point 6), there is another period to get used to the changes made during that first check. If then everything is ok, final check-up follows. Now it’s time to dot the i’s and cross the t’s. That does not mean that we don’t want to hear your questions or problems that may arise later. We know as no other that the combination of an orthosis and a leg is not constant. What’s okay today can be terribly annoying tomorrow. Therefore, you can request a consultation at any time (click here for contact details). We will look together with how we can help you and and make your orthosis as you wish. Your orthosis requires maintenance. Therefore, it is important that you let your orthosis check periodically. For most people once a year is enough, but with very intensive use it may be necessary to let it check more often. The periodic check is not only for your orthosis. It’s especially for you. During the periodic check, we look whether your orthosis is still the most appropriate solution for you. Perhaps you have become stronger in certain muscle groups over the past period, or you have lost strength and control. Both may be a reason to advise you on any other provision.